The figures presented here were selected to illustrate aspects of the epidermis and the many types of cells that occur as part of the epidermis. More than many other tissues, the epidermis may be extremely complex in some plants; the epidermis of stems and leaves may differ from that of the roots, of course, but also may differ from the epidermis of sepals, petals, stamens, and carpels. Even the two sides of a single leaf typically differ significantly. Consequently, this chapter is longer than many of the others, with micrographs illustrating a wider diversity of cell types and arrangements. As in the other chapters, these legends have not been written to be a complete discussion of all aspects of the epidermis, but rather to complement the more complete discussion of the epidermis presented in Chapter104 (pages 167 to 198) in the textbook Plant Anatomy by J. D. Mauseth, published by Cummings & Hathaway. Click here for a set of links to the micrographs of this chapter. 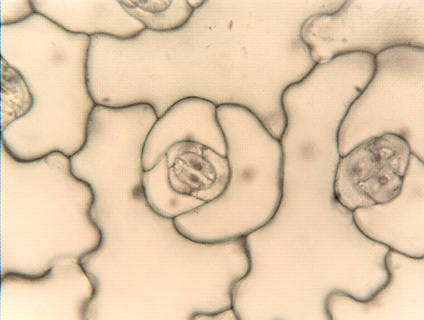 Epidermal peel, showing ordinary epidermal cells and a stomatal complex.